There are so many great foods out there, but risotto definitely holds a special place in my heart. Risotto oozes comfort food, with its creamy texture and beautiful soft colors. And it goes perfectly with a nice cold glass of wine. What a delightful dish to welcome in a cool fall day. Oh, and check out my snazzy red bike in the background…it’s my new fun (and functional) toy! 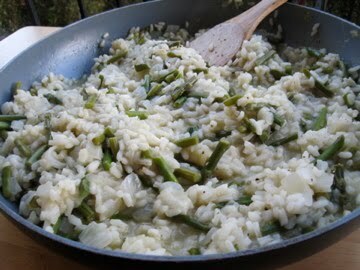 Back to risotto, what exactly makes it taste so creamy when there is no actual cream in the recipe? Starch. Yep. Alice Waters says: “Risotto is made from starchy short-grain rice (it looks much plumper than other varieties of rice), which, when moistened with successive additions of stock, gains concentrated flavor and a distinctive saucy texture.” The most well-known risotto rice is called Arborio rice, although many other varieties are used in Italy: Vialone Nano, Baldo, and Carnaroli. Yes, when you make risotto, the whole process takes about 45 minutes standing more or less on-guard, stirring occasionally and adding broth a little bit at a time. You have to give your rice some love, otherwise it won’t love you back, and I’m not just saying that to be cute. It’s actually quite relaxing to make risotto, it’s one of those sort of mindless tasks that just feels good. 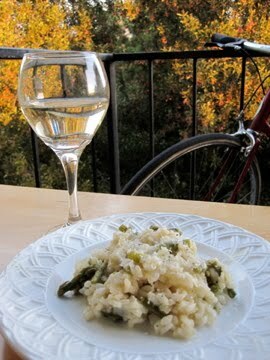 The basic idea of risotto is to saute an onion (or shallot, garlic, leek…), add the rice for just a few minutes to let it get all nice and roasty toasty (it should turn translucent but should not start to color or brown), and then pour in a bit of wine for some fruity acidity. White wine is typical, however red wine or beer can be substituted. Once the wine evaporates, broth or stock is added, slowly over a longish period of time. The final touches involve grated cheese of course! Oh yes, and some good company with which you can share this wonderful meal. Cut the spears on the diagonal into 1/4-inch pieces. Set aside for later. Cook the rice, stirring now and then, until translucent, about 4 minutes. Do not let it brown. Stir vigorously to develop the creamy starch. Taste for salt, adding more as needed. 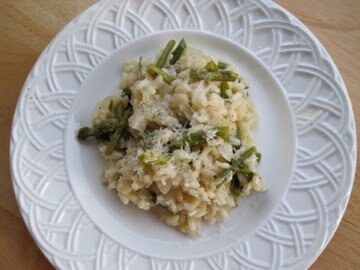 Turn off the heat, let the risotto sit uncovered for 2 minutes, and serve. Add a splash of broth if the rice becomes too thick.